I read this article and thought it was brilliant, thought it might be something for you. 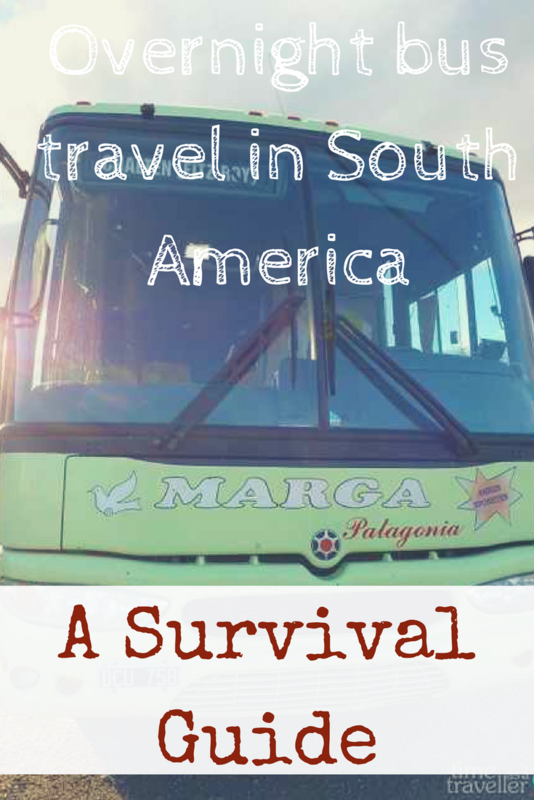 The article is called Overnight bus travel in South America – A Survival Guide and is located at https://timeasatraveller.com/overnight-bus-travel-in-south-america-a-survival-guide/. I love travelling by night bus in South America. There's a sentence you won't hear often. But I do, I LOVE IT. With big fat dirty capital letters. Most people will give an array of horrid cramped experiences. And they're telling you the truth, it's a tough experience. But a wonderful one. Why do I love night bus travel in South America? It's the adventure. The intrigue. The... Open Road. I love taking the time to get to a destination... feeling the distance between one place and another. Yes there is potential for danger, for stolen possessions, for bus hijackings, for short overweight Bolivian men to try to serenade you. I even know a guy who had... well... a 'stomach bug', but had to take that particular night bus, so he taped around the ankles of his jeans incase he sh*t himself en route. Yes really. There's potential for just about anything on the night bus, including getting stuck sitting next to that guy. You have options of swish to ... not so swish. And I've taken all of them. The first time was in Peru, from Cuzco to Nazca and quite a nice experience. Then there was a not so nice experience in Bolivia, an awesome adventure on Route 40 in Patagonia, and even a 52 hour long bus ride from Ushuaia to Buenos Aires. I've even ditched the night bus and taken a long haul cramped mini-bus in the south of Colombia (and a milk truck in Ecuador, but that's another story), and many many a chicken bus. And I'd do them all again, just as they were. It literally means 'bed' or 'half bed'. They are your two options on most night buses. A Semi-Cama option is cheaper and is your standard bus seat but it reclines further than normal, about half way. Cama is deluxe and more expensive. Depending on the bus company, it's often like a big leather lazy boy arm chair. It reclines almost all the way and is in a separate section of the bus, usually on the bottom level. Cama seats often include service on the bus. I found Semi-Cama to be fine for most trips up to about 15-20 hours, but I'm compact and can sleep on any moving vehicle. Except for the 52 hour bus ride, when my Cama bus ticket cost the same as a flight. I'm not just talking a jumper, I'm talking a long sleeve top, a jumper, a down jacket, long pants and woollen socks. It may be 40 degrees outside, but inside the bus its sub-zero. Pretty much dress for the snow. South American bus drivers love air-conditioning, like they loooooooove it. They will pump the air-con for the entire trip, and it will get freezing cold. From the most expensive to the cheapest bus company, this is one way they are all equal. My advice? Wear your summer gear on the bus and take all of the above items of clothing in your carry on pack. And a blanket if you have one. I take my sleeping bag on and snuggle into that. Ensure all your gadgets are fully charged before getting on the bus, and make sure you carry headphones. With a flashy bus company like Cruz del Sur in Peru, you're likely to have a tv on the bus with movies that have English subtitles. But on a cheaper bus, or any bus in Central America, you're likely to have an assortment of country music clips, all of which will feature a small round latino fellow who has lost the heart of his gorgeous model girlfriend and is pouring his heart out in the middle of a field... with an accordion... they always have an accordion. Carry earplugs. Most will have a toilet, the cheaper ones that don't will provide toilet stops, occasionally this might be in the middle of nowhere where you all get out and pee together on the side of the road. Take toilet paper and hand sanitiser. This is often why your hostel will be out of toilet paper, people take it for the bus ride. Regardless of how nice the toilet is on a bus, they're all going to get nasty at some point of the 15 hour+ long bus trip. Any long-haul road travel in South America will involve having Snickers bars for breakfast... and lunch... and snacks. It's the one staple you seem to find everywhere. If you want to avoid this, take food. There will be food stops but don't depend on these. A food bag is a good idea, keeping it separate to your important things means you can leave it in the hold above your head on the bus. Lock your bags. Your main pack in the hold of the bus needs to have locks on every zip. The pack onboard the bus that you keep with you at all times must also have locks on the zips. I use to use combination locks and gave all the locks the same code to make it easier. Money - Split up your financial resources. Keep one debit card on you in your money belt, one in your backpack under the bus, cash money in separate pockets, credit card and emergency $US in your money belt with your passport, which will be in your pants, not up around your belly. Depending on where you're travelling, keep emergency cash in your sock in case your bus gets hijacked. Don't tell people at bus stops where you're going. This was a tip i was told when I was 17 taking buses around the North East of Brazil. It increases the risk of getting hijacked. Before we got off the bus we'd be told the destination to tell people if asked, and it was in the opposite direction. You're likely to wake up and notice the cabin of the bus has filled with people who have been picked up along the way. Expect it and be nice, but it's another reason to keep your valuables on your person and your bag looped around your feet and locked. You're likely to have someone get on the bus selling things. The guy who stands up the front of the bus and starts a long speech, it's that guy. This is just what happens. Often it will be magnetic jewellery or some other thing that's not really useful for a traveller. Smile nicely, feel free to decline the offer. Money Belt - Wear it below your belt line. Yep, it gets uncomfortable, but keep everything of value on your person... in your pants. Finances as noted above, separate your resources. Keep the most important things on your person. Small backpack to keep at your feet or in your lap for the trip - for your valuables (laptop, camera, etc). If you have it at your feet always put your legs through the straps when sleeping, if its in your lap put your arms through the straps when sleeping, anything that will wake you up should someone try to take your bag. Lock the zips, even on your carry on bag, people do get things stolen right from under them very easily. Never keep your carry on bag in the overhead area, it'll likely be gone when you go to leave the bus. Separate bag for food / extra clothes and non-important things - to keep in the hold above your head. You've probably got enough stuff in the seat with you, this will keep you more comfortable. And finally, don't let your hostel book your bus ticket for you. They'll likely book you on a very cheap bus but charge you the fee of the expensive bus. Research the best bus company (if that's what you're looking for), go to the bus terminal and do it yourself. 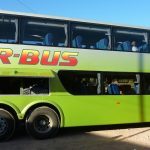 I found this out the hard way when I was relatively new to long-haul bus travel in South America, on a 'Trans-Copacabana' bus which was booked by Wild Rovers hostel in La Paz. You can read that story here. Alternatively if comfort and safety don't bother you and you're looking for more adventure, like the way I became after a few months of backpacking in South America, then screw it and book whatever you find available. One final tip, enjoy the ride. What do you think? Did we cover everything? Tell us your additional tips in the comments section below! Hi Kimberley, I also love travelling by night bus.. something I can’t understand, though, is why it’s always so damn cold inside when it’s 40 degrees outside. I heard they only have on and off button, so it’s super hot or super cold.. you decide! haha.. I always take a sleeping bag, just in case.. in Asia it’s even worse. I remember that time in Malaysia, I had all my clothes on, inside my sleeping bag.. and still cold! Crazy people! Hi Miguel! Ahhhh, so that’s the reason. Makes sense, on/off 🙂 A sleeping bag is the perfect companion for a night bus! Wow!! The whole hijacking thing is enough to make me seriously reconsider the night buses. I know they might become necessary, but I can’t even imagine going through something like that. The closest we came was getting robbed on a night train (I got lucky because I was sleeping on my stuff, but my friend had her stuff up in the overhead — gone!). But at least that was while we slept, and not an actual confrontation. Still, I get the appeal of the open road and being able to see things as you traveled. It’s an experience you just don’t have when you fly. Excellent tips on how to manage this all! Fantastic guide to bus travel in SA. I havent been to that part of the world yet but looks like some of the places I want to go to involves long distance bus journeys so will use this as a guide. Great, hopefully it helps Danik! It is a truely incredible part of the world, hopefully you make it there. Great tips here. Give me a ‘Cama.’ I haven’t ridden a night bus since Turkey. I had one great experience and one horrible one, and I think I’m done. That said … when in South America. Actually the fully reclining seat sounds like Business Class on a plane. Not bad! Absolutely, Cama seat is a great option. They do know how to do long haul bus travel over there 🙂 Night buses in Turkey, now they are stories I’d love to hear! Great tips Kimberley of course buses can be daunting and it is really about being street smart and prepared as you outlined here. Great tips to secure your valuables, and being prepared for everything. Thanks! Thanks Dorene. You’re absolutely right, being street smart will get you a long way! Buses are a practical, and sometimes the only, way to travel around South America. You provided a great list of useful typos here. Thanks Brianna, hopefully it’s helpful. Yes, in South America it is usually the only way. And a great way too, bus travel in south america is a must. I usually prefer to splurge and book a flight to save time, but sometimes there’s just no other option. I’ve heard some horror stories about South America bus travel, but fortunately we were actually quite impressed with the service when we took them in Peru. Yep, we took a Cruz del Sur bus in Peru and it was brilliant. My first ever night bus. They certainly know how to do long haul bus travel well. Really enjoyed traveling by bus in South America. Fortunately, our bags were safe and there was no theft on board any of the buses we took. The cold is something else and your tip to bring a blanket is a good idea. I wish we had known about the a/c temperatures before we left. My favorite buses were the ones in Argentina. Clean, good food and one bus we even played “bingo.” Helpful post! Thanks Rosemary! Argentina is great for night buses, they do long distance comfort so well 🙂 Bingo is a brilliant idea, have to remember that one for next time. I would definitely would be one of those people will giving an array of horrid cramped stories. I definately see the benefits of passing through small towns and making pitstops along the way. I can also see the financial benefits too but I can’t handle being on a bus for more than 2 Hours. For me personally, your not selling this very well. Lolol. Night trip, no sleeping for me. Nasty toilet on the bus or pit stops with toilet paper and hand sanitizer, bus getting kidnapped… I think I’ll fly or take the train.